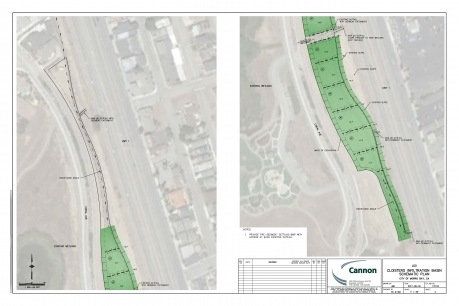 Currently, stormwater runoff from the residential land use Drainage Management Area (DMA) discharges, untreated, to five outfalls located along Highway 1. Runoff is routed through an existing swale and is then conveyed to a natural wetland. The Green Infrastructure project opportunity includes modification of the existing swale to improve detention, infiltration, and water quality treatment by creating a series of infiltration cells that slow and hold water. Excess flows would be conveyed to the existing wetland. Additionally, flows from DMA 3 would be routed as the current situation to provide sufficient flows to the wetland. Given the large DMA, retention and treatment performance does not equal the 85th percentile, 24-hour storm event water quality objective. However, significant stormwater management is provided at a low cost ($6.50 per square foot).